5J Cinco Jotas, loyal to its roots, to retain the pure race, in addition to protecting the natural biological system of racial reproduction. A team of veterinary and agricultural technicians committed to comprehensive research, care and control purebred Iberian Iberico and their place of residence - Fruit Habu village De Aisa pasture. Our 100% Iberian pigs generation pro underwent strictly controlled and registered in AECERIBER official breed record books in order to ensure its authenticity varieties. Do you know? Iberico Iberian pure degree is determined by its source varieties. 100% Iberian pig sows and boars only for those who belong to the same race 100% Iberian pig breeding. Most of Iberian ham from Iberian pigs hybridization. In fact, only 5% of the peninsula southwest pastures of the Iberian pig is 100% and Acorn living. Sows and boars hybrid varieties in Europe Iberian pig 100% Iberian breed - because of the high yield needs to pick a hybrid pigs born, its taste and aroma are 100% purebred Iberian Iberico different. De Aisa pasture is the most important fruit acorn. 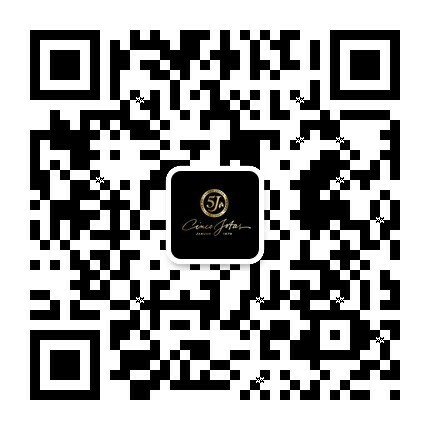 This is the key to achieving the highest quality 100% Iberian ham, acorn ham to bring the characteristics of the doctor and researcher of the last century Grande Covián praise as a "long-legged olives." 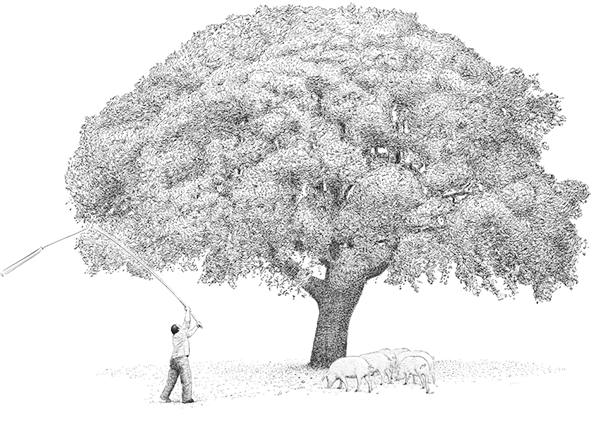 Although there are five different pasture Dehesa acorn (summer oak, cork oak, holm oak, Portuguese oak and red oak), the most common acorns from holm oak. When the nascent green, shiny dark brown with a long time to mature, which is the mountain grazing period. Like a treasure to be protected as a third layer of shell bucket wrapped fruit. Acorns and oleic acid from starch is to make healthy food ham become a major factor. Such oleic acid (olive oil was very important) is a monounsaturated fat can help us regulate metabolism. Therefore, it can reduce cholesterol (harmful substances in our body) and the prevention of cardiovascular disease. 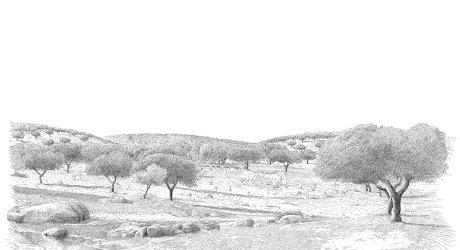 De Aisa pasture peninsula southwest of 5J Cinco Jotas 100% Iberian pigs ensures the best ingredients. During the mountain grazing animals running back and forth every day to find the Acorn ---- their main food organ responsible for ensuring its quality, and can help reduce harmful cholesterol and improve cardiovascular health, the amount of up to 14km per day run. Thanks to the 100% Iberian pig movement in 德艾萨 pasture and their ability to adapt, resulting in intramuscular fat infiltration, giving the muscle texture, reaction to the ham has become a distinctive flavor. 100% black Iberian pork from two months old to play 18 to 24 months, mostly pure natural free-range. It is a pure natural food, is 100% free-range ham Iberian pig production, provide a high quality and taste delicious. The Birthplace of Ibérico Ham. If Habu village located in the Aracena and Aroche nature park peak, UNESCO (UNESCO) as the Sierra Morena meadow Biosphere Reserve. The town has a unique advantageous climate, ideal for 100% Iberian cured ham. Important curing process constantly reconcile fixes and enhancements ham texture and taste, let 5J Harb fruit from the village of Cinco Jotas ham different. 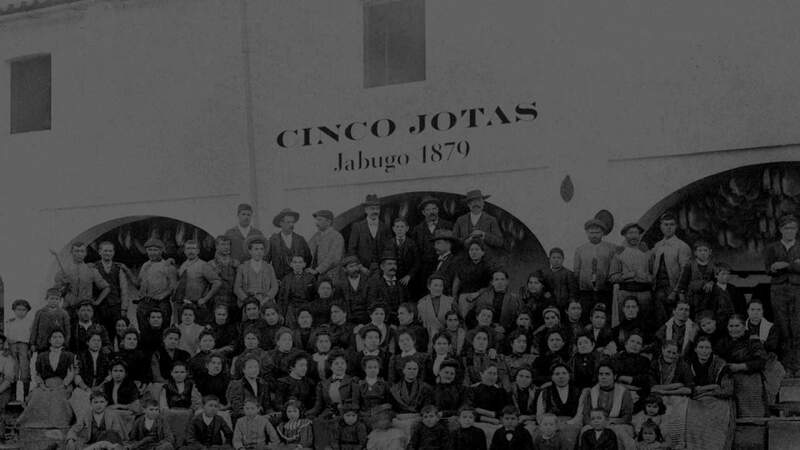 Since 130 years ago, 5J Cinco Jotas has been insisting all of its natural handmade products, retains passed down through generations of experience and tradition. Traditional cellar 5J Cinco Jotas is maintained at a constant temperature and humidity get slow nature of the curing process, the real protagonist of nature to this process. 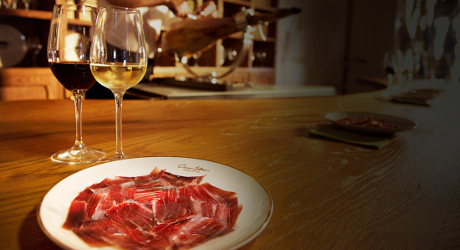 5J Cinco Jotas - THE HOUSE WITH THE MOST 100% IBERICO HAM HERITAGE. "I always ask myself: how many more years are we going to be able to do it?" Since its origins, 5J Cinco Jotas has had the wisdom of Jabugo locals who have been contributing their traditions and ancestral culture for five generations. Tradition has been maintained all the way to today because they have preserved the specialised trades created based on the knowledge inherited and the skill acquired. All of the processes are completed just as they were long ago meaning the detailed work that goes into each piece makes each Acorn Fed 100% Ibérico Ham truly unique. 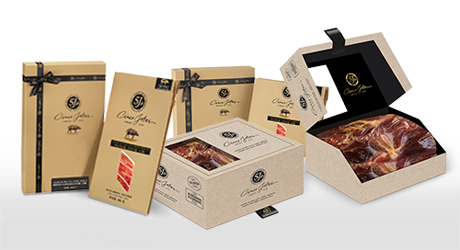 5J Cinco Jotas - THE HOUSE WITH THE MOST 100% IBÉRICO HAM HERITAGE. Since its origins, 5J Cinco Jotas has had the wisdom of Jabugo locals who have been contributing their traditions and ancestral culture for five generations. Tradition has been maintained all the way to today because they have preserved the specialised trades created based on the knowledge inherited and the skill acquired. All of the processes are completed just as they were long ago meaning the detailed work that goes into each piece makes each Acorn Fed 100% Ibérico Ham truly unique. WITH THE RIGHT TECHNIQUE, THIS PERSON MAKES SURE THE PIECE IS PROPERLY RIPENED BEFORE SALTING. Knowledge and experience are essential to removing the exact quantity of pork fat. Otherwise, the ham would dry our or harden. Each profiler is responsible for marking the profiled hams in order to maintain exhaustive quality control throughout the process. 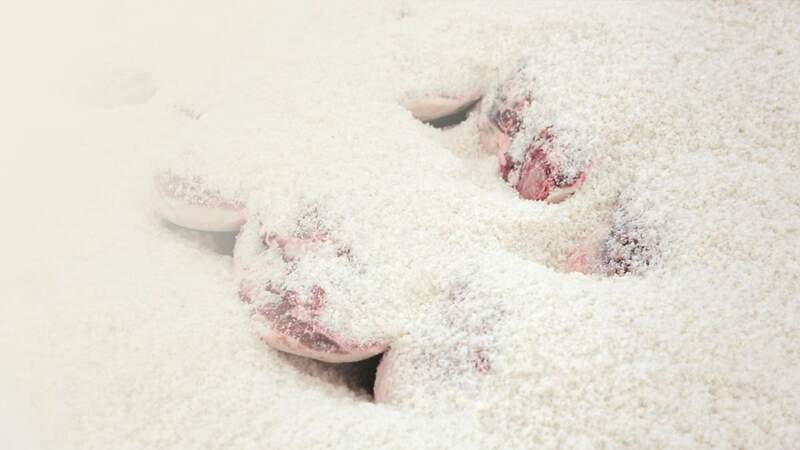 This person ensures that the salting process is done right as each 100% Ibérico ham is manually buried in salt from the Atlantic. The perfect calculation of the weight of the piece, just the right amount of salt and the concentration of sodium chloride are key to the quality of the ham. During the drying phase, the drying chamber supervisors are the essential figures as they monitor this part of the process when the temperature and moisture are fundamental to the piece attaining the perfect balance. The location of the 5J Cinco Jotas drying chambers in Jabugo, 650 m in altitude, and the local Jabugo micro-climate are key elements in the production of this gastronomic gem. EXPERIENCE, SENSITIVITY AND HIGHLY DEVELOPED TOUCH AND SMELL SENSES ARE KEY TO CONTROLLING THE LEVEL OF OXIDATION AND CURING IN A 100% IBÉRICO HAM. The unique and one-of-a-kind pieces must be monitored daily so they attain excellent quality in this phase, which is one of the last in the process. 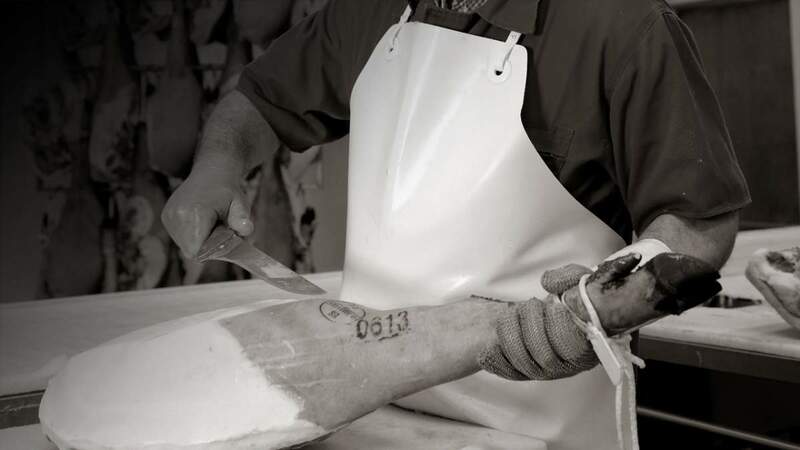 Many times this trade is practised by the Master Piercer who conducts the final quality control before our 5J Cinco Jotas hams reach consumers. Our ham is pierced in four areas to verify the ideal ripening state. A piercer’s sense of smell is of utmost importance as there can be more than 100 different smells in a ham. CARVING HAM UNDOUBTEDLY INFLUENCES HOW THIS DELICACY TASTES. Professional carving boosts the flavours and aroma of the ham so it can be appreciated in all of its splendour. Rashers must be very fine, transparent and the right size for eating in a single bite. The flavour should be mild and it should melt in your mouth, releasing penetrating and long-lasting aromas and sensations. Tenacity, elegance, serenity, delicateness... As if a sculptor, a Master Carver knows perfectly well each figure they work with. Their well-polished and prepared tools allow them to exercise their mastery without having to exert force when carving but rather skill and firmness. Distinguished steadiness and constancy allow them to do their best carving at a pace set by their eyes as they slowly and deliberately produce fine rashers to delight the most demanding of palates. HIDDEN WITHIN OUR HUNDRED-YEAR-OLD CELLARS. 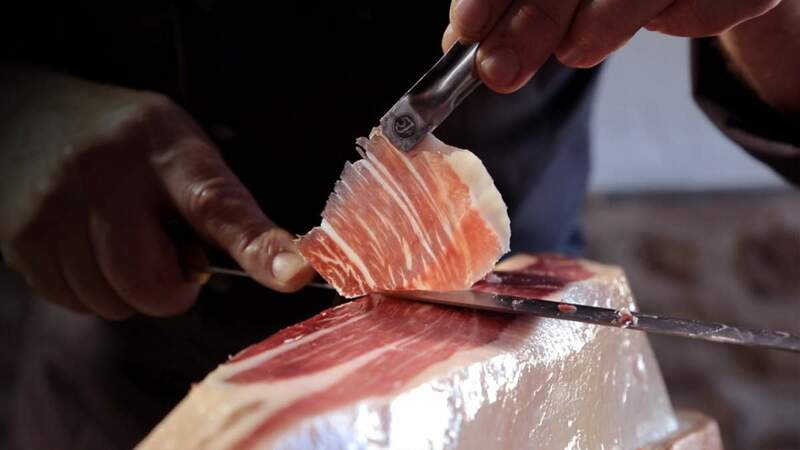 100% Ibérico ham is not only a dive treat from nature but also a food that is recommended for a healthy Mediterranean diet. 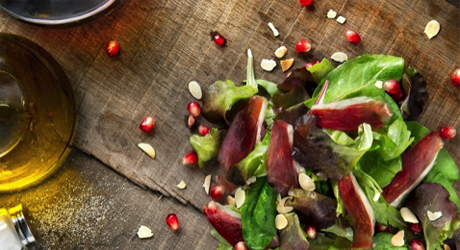 Thanks to the acorns, the meat is rich in Omega 9 oleic acid - known for its great cardiovascular benefits. Curing a Cinco Jotas Acorn fed 100% Ibérico Ham follows an artisan method that can take up to five years to be completed. Because this is the only way it can be considered an authentic 100% Ibérico Ham.